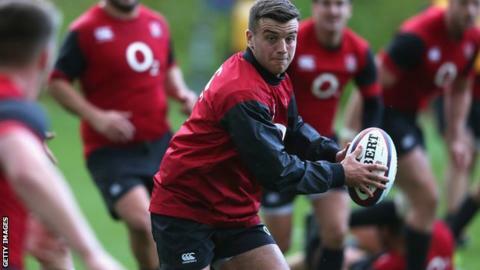 Bath's George Ford needs a few more big games to secure the England fly-half spot, says predecessor Toby Flood. Ford, 21, started November's wins over Samoa and Australia and is favourite to start the Six Nations opener against Wales in Cardiff ahead of Owen Farrell, Danny Cipriani and Stephen Myler. But Flood, who won 60 caps from 2006 to 2013, says the competition is fierce. "The scary thing for a 10 at the moment is there are so many good players," the former England stand-off said. "George has had a couple of good games, but I think he probably needs - as he knows - to back it up with a few more and come out of this tournament having had maybe three or four really strong games." Flood and Ford were team-mates at Leicester before the latter moved to Bath in 2013. "From an attacking point of view, he can create chances, open doors and put people through gaps in a way that Farrell, and maybe Ford, can't. "They've got the shirt right now and their basics are very strong. Maybe that side has let Danny down in the past but he has matured a lot as a player and he's one of our top tacklers every week, which is not something you'd have said two or three years ago." The pair are likely to face each other this Sunday, when the Premiership side visit Flood's Toulouse in the European Rugby Champions Cup. "I think he feels like he's a leader of that team, which is what you want at 10," Flood told BBC Radio 5 live. "Everything he has done he has earned himself. He's an exceptionally hard-working kid and he left Leicester because he wanted to play." Flood sacrificed his own England career by moving to France. However, he believes head coach Stuart Lancaster may activate the "exceptional circumstances" clause to allow him to include Toulon forward Steffon Armitage in his pre-World Cup training squad this summer. "I think the rules slightly bend for the World Cup scenario," he said. "I think the door is a little bit ajar. "People such as Steffon who are playing well may be brought in. Sometimes you have to pick the guys who are playing well and can do a job for you at the World Cup."